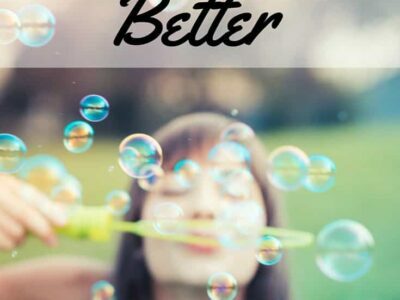 Do you have a to-do list that’s gotten way too long? Is there just too much stuff you want to do, and not enough time to get it all done? 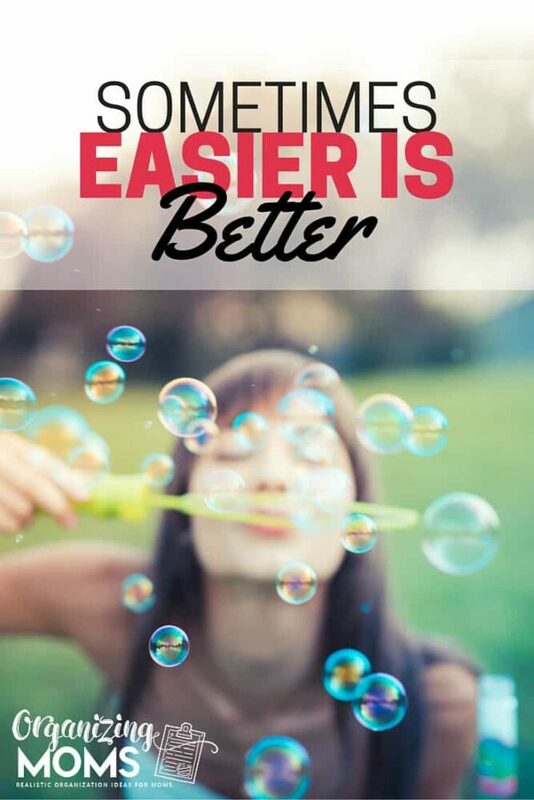 Sometimes, easier is better. Sometimes, in an effort to be more organized and productive, we just make things too complicated. Last week I was feeling like there was just WAY too much stuff going on, and I knew I was never going to get it all done. My to-do list had become a productivity wish list, and I was totally expecting to complete everything on it. Something had to give. Either I needed to hire a full-time staff, or I needed to re-adjust my expectations. For financial and practical reasons, I opted to re-adjust my expectations. After examining the list, I realized that some of my to-do items were just plain crazy. I decided to get rid of them, and replace them with simpler, easier alternatives. 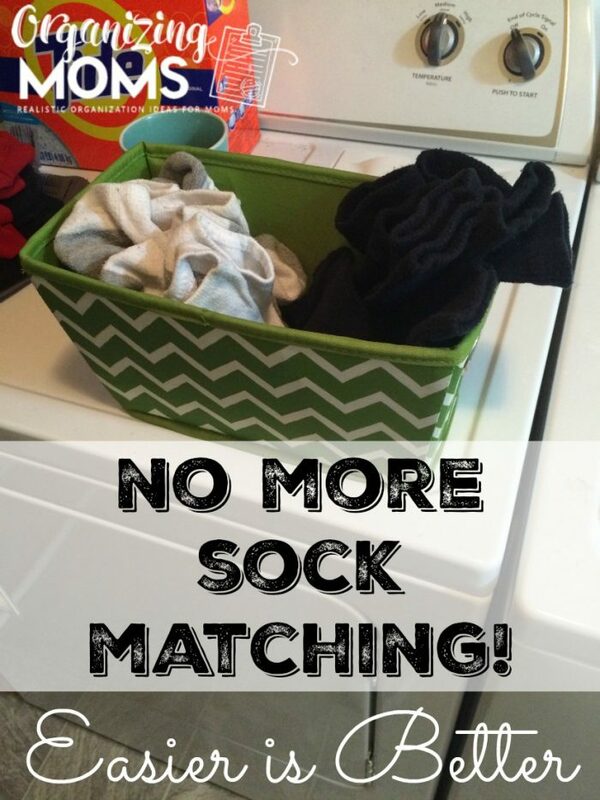 Too Difficult: Matching and folding socks. This was on my to-do list. I was going to watch a show and match socks (what fun! ), then I’d bring them to everyone’s sock bins in their bedrooms. Talk about a bummer and a total waste of time. Solution: Sock basket. Last fall I bought a bunch of the same types of socks for my kids so I wouldn’t have to spend so much time matching. I decided to finally donate the old socks, and stick to my original plan of only having one type of black socks, and one type of white socks. I chucked them all in a basket, and put it in the laundry room. When I’m taking laundry out of the dryer, I put socks directly into the basket. Now when the kids need socks, they can go in the laundry room and grab what they need. Time Saved: 45 minutes each week + loads of aggravation. Too Difficult: Elaborate Meal Plans. You guys, I’ve been cooking like I’m a culinary school wannabe without much success for way too long. It’s gotten way too complicated, and we were wasting a lot of food because of my lack of cooking skills. Solution: Embrace the sandwich. Sometimes, dinner is going to be a turkey sandwich and some applesauce. I still like to meal plan and cook new things, but it had gotten out of hand. It needed to happen once a week instead of every day. Time Saved: 45 minutes per meal. Plus grocery shopping time, and time spent nagging family members who don’t want to try out the new dishes. Too Difficult: Once a Month Cooking. In an effort to give myself a break, I was going to spend a day cooking for the whole month. I know a lot of people have great success with this. Thankfully I remembered that I have NOT had great success with this in the past. When I did Once a Month Cooking, I spent the whole day cooking, away from my family, and I ended up exhausted and bitter. Then, the food was kind of gross because I was cooking random recipes that didn’t always freeze well. Solution: Double the batch. When I make something that could be frozen, I make a double batch. We can eat the meal, and I freeze another meal. That way, there’s stuff in the freezer that’s not disgusting, and I know there’s a good chance that my family will actually eat it. Time Saved: A DAY of cooking, plus grocery shopping time, washing dishes time, and time spent planning for the day of cooking. Okay, I know I’m not the only one. What things are on your to-do list that are just driving you crazy?